MILITARY SERVICE: United States Army Reserve (Ret.). Recipient of: The Chief Justice’s Distinguished Judicial Service Award (2005), American Bar Association Pro Bono Publico Award (1995) (recognizing public service), The Florida Bar Pro Bono Award (1992), The Florida Bar President’s Award of Merit (1992 and 2001), and Outstanding Member of the Year Award from Florida Bar Business Law Section (2004); Executive Editor, University of Florida Law Review (1968-1970). 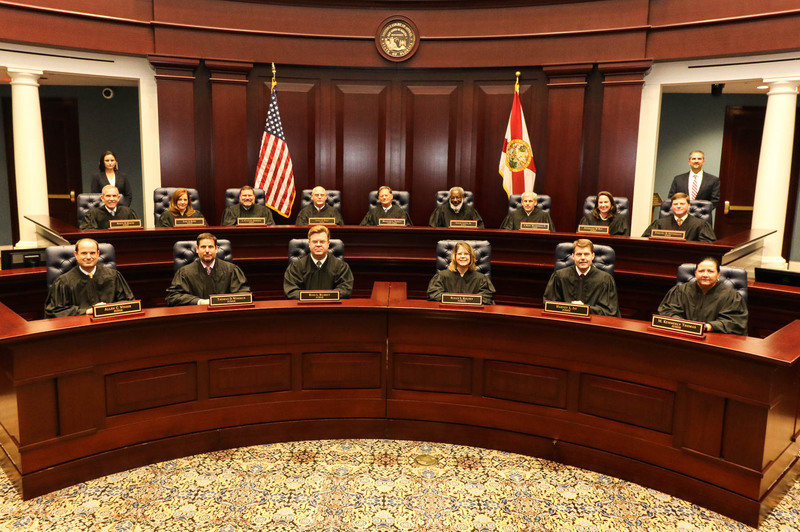 - State: Florida Supreme Court Professionalism Commission (1995-2001, 2005-present)Chair, Budget Committee (2002-present), Judiciary Sub-Committee (2005-present)); District Court of Appeal Performance and Accountability Commission (2002-present) Chair (2008-Present); Florida Supreme Court Committee on Jury Instructions in Business Cases (2006-present); Florida Bar Standing Committee on Pro Bono Legal Services (1993-present); Judicial Liaison, Florida Bar Business Law Section (1999-present); Chair, Florida Bar Equal Access to Justice Retreat (2001); Board of Directors, Florida Legal Services, Inc. (1982-1987), President (1985-1987); Board of Directors, Florida Bar Foundation (1985-1994), President (1993-1994); Chair, The Florida Bar/Florida Bar Foundation Joint Commission on the Delivery of Legal Services to the Indigent in Florida (1990-1993); Fellow, Florida Bar Foundation; Board of Governors, Florida Bar Young Lawyers Section (1978-1979); Member, The Florida Bar. - Local: Member, Jacksonville Bar Association and Tallahassee Bar Association; Chair, Corporation, Business & Banking Section of the Jacksonville Bar Association (1982-1983); Board of Directors, Jacksonville Area Legal Aid, Inc. (1973-1980), President (1978-1980). - National: Member, American Bar Association and International Bar Association; ABA Business Law Section; American Judicature Society; Judicial Forum of International Bar Association; Fellow, American Bar Foundation. - Professional Education: Adjunct Professor of Law, Florida State University College of Law (1997-present)(teaching professional responsibility); Florida Court Education Council (2006-present); Visiting Professor, Faculty of Law, Trento University, Trento, Italy (2009); Appellate Associate Dean for Florida College of Advanced Judicial Studies (2006-present); Coach, Securities Law Moot Court Team, FSU College of Law (2005-present); frequent instructor for continuing legal education and continuing judicial education programs. Florida-Georgia Blood Alliance, Inc. (blood bank serving Northeast Florida, Eastern Georgia and South Carolina), Board of Directors (1990-present), Treasurer (1994), Chairman (2006-7); Child Development Services of Northeast Florida, Inc. (Head Start), Board of Directors (1990-1991); Race Director, River Run 15,000 (1980); Member: Leadership Jacksonville, Rotary Club of Jacksonville. Co-author, Pro Bono Services in Florida, 73 Fla. Bar. J. 30 (1999); co-author, Regulation A and the Amended Florida Private Placement Exemption, 57 Fla. Bar. J. 578 (1983).